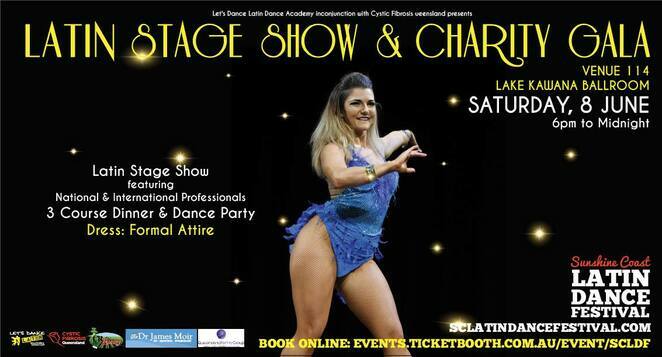 The Latin Dance Stage Show & Charity Gala is the signature event of the Sunshine Coast Latin Dance Festival. Held on Saturday, 8 June at Venue 114's Lake Kawana's Ballroom, this special family-friendly event will raise much-needed funds for Cystic Fibrosis Queensland and support 65 individuals and families living with this chronic disease on the Sunshine Coast. The one-night only spectacular showcases thrilling performances by World and Australian Latin Dance Champions. There will be over 100 performers on stage with special guest MC Sam Coward from 91.1FM and Jean-Luc Lambs, with presentations followed by DJ dance party. Guests will be treated to a delicious 3 course meal as well. The Latin Dance Stage Show & Charity Gala is the biggest event of the festival! Tickets are now on sale through www.sclatindancefestival.com/gala. Please book by 3rd June 2019. Don't miss this world-class Latin dance showcase on the Sunshine Coast. To find out more, please visit www.sclatindancefestival.com/gala and follow the Facebook Event. Latin Dance Stage Show & Charity Gala was created in memory and honour of fellow dancer Kari-Lee, who lost her battle with Cystic Fibrosis 4.5 years ago. She was a huge part of the Sunshine Coast Latin dance community and loved to dance. Each year, her life and the lives of those affected by this disease are celebrated through a shared love of Latin dance.